Family meal night across America just got easier, and so did entertaining on a budget. 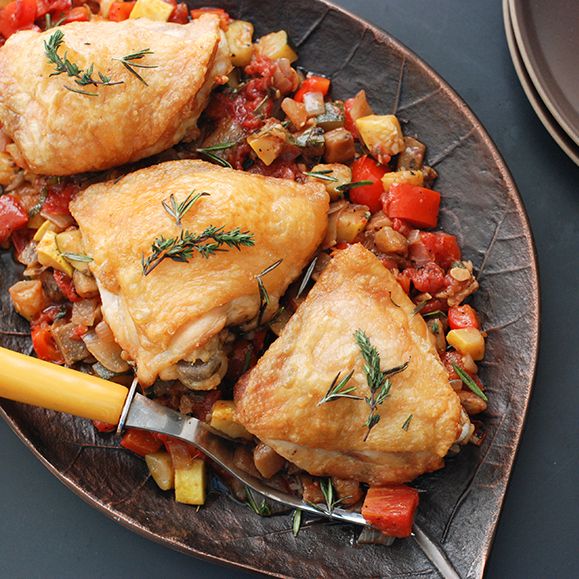 Ratatouille paired with roast chicken pieces is a classic combination that even your kids will devour. If you care to, this dish works equally well with turkey quarters on the grill: Use the same marinade, but roast using indirect heat over wood coal for about 80 to 90 minutes for dark quarters, and 70 minutes for turkey breast. Preheat the oven to 400°. In a large bowl, toss the chicken with all of the remaining ingredients. Arrange the chicken skin side up on a rack set over a rimmed baking sheet. Roast for 40 to 45 minutes, until the chicken is golden and cooked through. In a colander set over a bowl, toss the eggplant with the 1 teaspoon of kosher salt. Let stand for 30 minutes. Gently squeeze the eggplant to release any bitter juices. In a large skillet, heat the olive oil until shimmering. Add the eggplant and cook, stirring occasionally, until golden, about 3 minutes. Add the zucchini, yellow squash, onion, red pepper, garlic, basil and oregano and cook over moderate heat, stirring occasionally, until softened, about 10 minutes. Stir in the wine, tomatoes and tomato puree and cook until the vegetables are tender and the sauce has thickened, about 10 minutes. Discard the herb sprigs and season the ratatouille with salt and pepper. Transfer the ratatouille to a platter, top with the chicken and serve.